Swami Karma Karuna, founding member and director of Anahata Yoga Retreat, NZ, is an engaging, intuitive yoga teacher with more than 25 years of training and experience in a range or areas such as therapeutic applications of yoga, Yoga Nidra relaxation, prana, chakras, women’s health and applications of yoga into daily life. Her wide range of teaching spans varying settings and cultures, including therapeutic and social areas, yoga teacher training, guiding spiritual sadhana retreats and working one to one addressing individual needs. 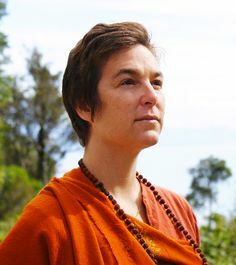 She spends several months each year in India and travelling internationally, dedicated to imparting simple and powerful techniques for transformation. Satsang is an ancient practice of being in the company of Truth (sat). Friday night satsang includes an open discussion on yoga topics led by Swami Karma Karuna. Everyone is welcome to contribute questions they may have on the broad subject of Yoga and its application in modern living. Topics that will be discussed include, what is Yoga, living Yoga as philosophy, practice and lifestyle, and more. Widen your understanding of the ancient system of Yoga and find out how capsules of yoga can be taken to address the uncertainty of modern living. Come and be inspired through sharing and learning from one another in a supportive yoga environment. Experience yoga postures, breathing techniques and Yoga Nidra relaxation as a means to create or change physical, emotional, mental or energetic states. Yoga is universal, however, different practices influence the body and mind in varying ways and individual applications of practices can enhance health and well-being. The science of Yoga Nidra is a systematic, deep relaxation technique, which allows the practitioner to unravel tensions and release memories stored in the layers of the body and mind. Learn the stages of Yoga Nidra and the therapeutic applications of each stage of the practice. Explore theory, practical applications and the science behind simple yoga practices as preventative and curative tools for health management with applications for common imbalances; digestive, menstrual, stress & anxiety, depression, cardio-vascular issues as well as any particular requests from the group. Individuals are welcome to attend for inspiration on how to enhance personal health, balance and relaxation in daily life and yoga teachers will cultivate tools to support students and bring greater depth to their yoga classes. In this workshop, we look at yogic management techniques addressing the needs of modern women. Discussion and practices to balance and optimize the physical, mental and emotions of the modern busy woman. Scan through the following questions and if you can identify with any of them, this workshop is for you. Do you feel stressed, over-stimulated or that there is never enough time in the day for everything? Experience issues with sleep? or feel low energy regularly? Overwhelmed by life? Have a sense of urgency? Finding difficulties balancing work and home life? Get digestive, menstrual, thyroid, blood pressure issues? weight imbalances? anxiety or depression? Feel over emotional or blocked in your ability to express yourself? Want more inspiration for your life? Feel guilty if you take time out for yourself? Concerned for your children? or challenged in your relationship? These are common challenges for modern day busy women and the practices of yoga can support us in a simple and accessible way. This workshop will include postures, breath and relaxation techniques as well as discussion on living a more balanced life in the midst of many responsibilities. This workshop is open to both women and men to understand the challenges and changes that women face and how she can apply yogic tools to keep her grounded in modern living. It will be guided by Swami Karma Karuna, who directs a busy retreat, is a mother and travels around the world teaching, constantly juggling the busyness of life and the strain of travel. She brings to you useful practices to use in your daily life that can influence your health, emotions, relationships, energy levels, focus and balance. Find out which practices suit your personality, body type, health or personal challenges and energy flow. Receive a program or guidance according to your needs and/ or ask questions about your yogic path. Swami Karma Karuna blends and applies practices according to individual needs supporting mental, emotional, physical and spiritual balancing and transformation. Yogic practices are powerful aides in the treatment of many physical and mental challenges including chronic fatigue, asthma and diabetes, digestive, structural, blood pressure and heart problems can also be balanced. Please note that no refunds will be given once payment is made.